If you google me I come up second. 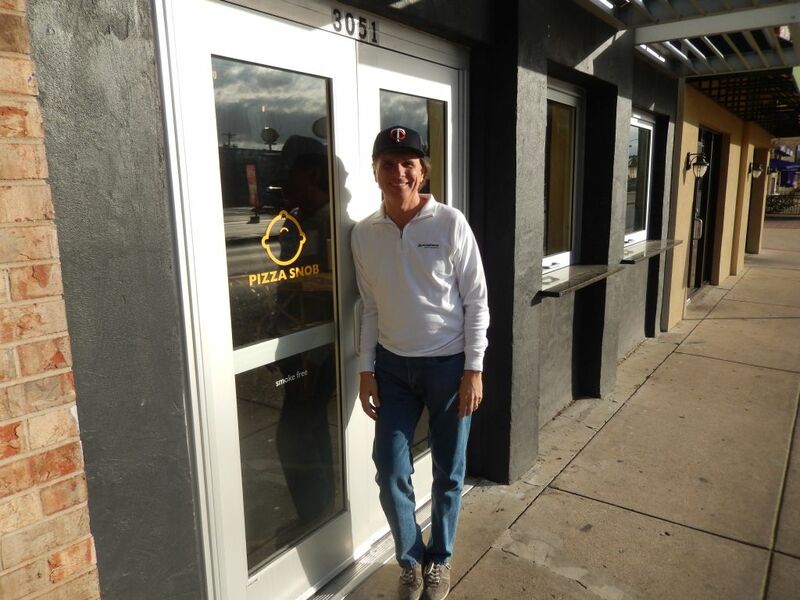 First place goes to The Pizza Snob, a build-your-own pizza restaurant in Fort Worth. Normally I would stay far away from something as untraditional as this, but I just could not resist the temptation to visit a place using my nom de plume. So, the last time I was in the Lone Star State, I grabbed my son, The Philosopher, and together we made an afternoon journey into Cow Town. 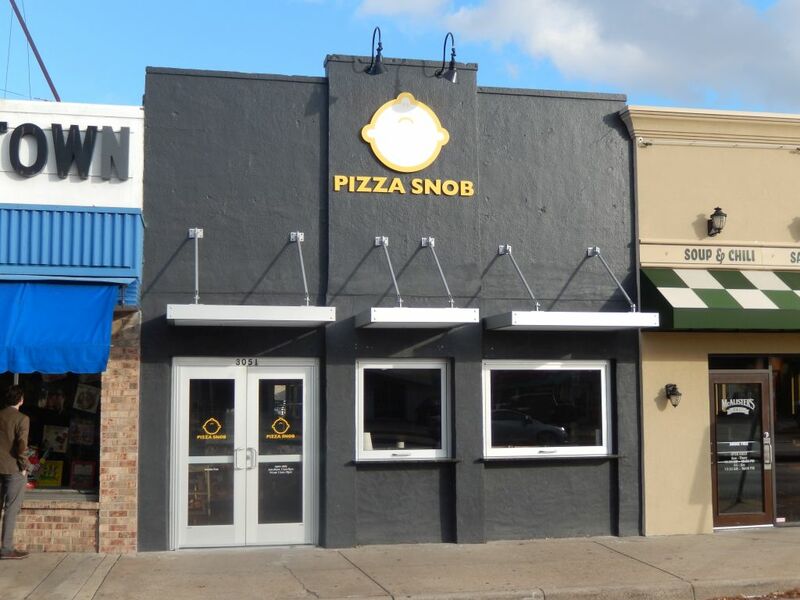 After stopping at the fabulous (wish they were in Tennessee) Half Price Books, we headed over to the Pizza Snob which is located right across from the main TCU campus. While rocking out to The Clash CD we just bought on the cheap, I pondered why my son is not the best critic to bring along on one of my pizza sojourns. It’s simple—he has never met a pizza he didn’t like! It also makes him nervous and unsettled when I take pictures and ask a lot of questions when I’m visiting a new place. But, he’s still fun to be with and he never says no to some pizza and beer courtesy of Dad. The purple street sign at the corner of W. Bowie and S. University told us we were in Horned Frog country. We easily found the swanky shop nestled in a row of vintage-looking storefronts. I was surprised to find that the Pizza Snob sits right next to the cool Record Town music store that I had previously visited. 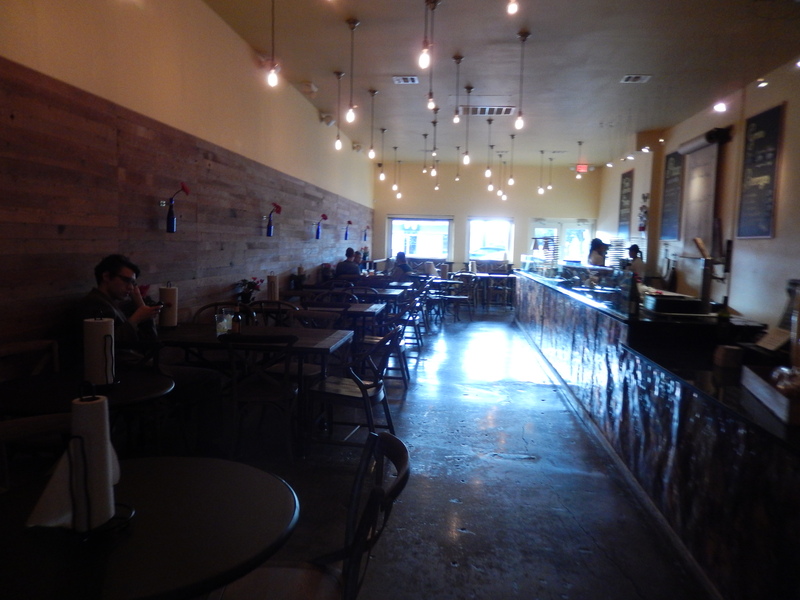 The Pizza Snob is a nicely laid-out restaurant. With school out of session, it was not very crowded on this late weekday afternoon. 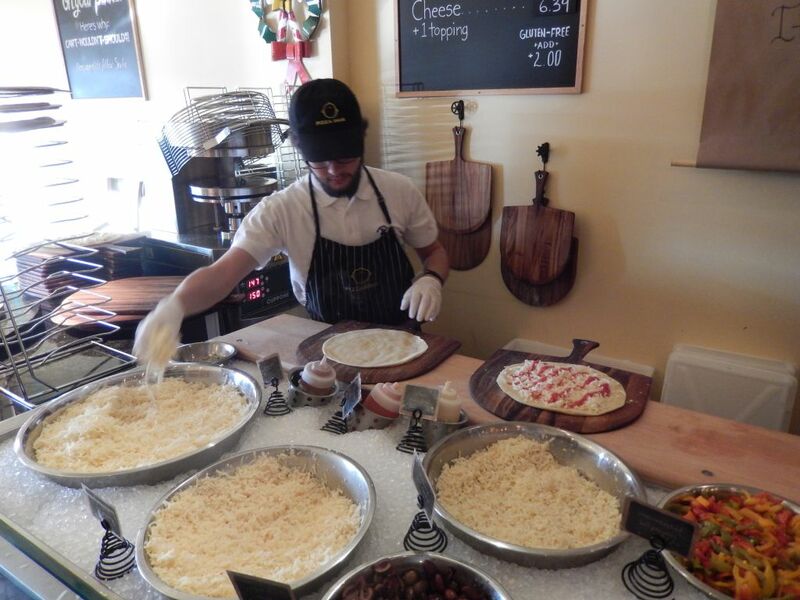 We made our way to the front of the assembly line where the process to personalize one’s pizza begins. You can get up to four toppings on your personal pie ($7.99). All are in plain view and fall into the categories of Cheeses, Sauces, Veggies & Such and Proteins. They are a foodie’s treat (subject daily to the chef’s whim) and your choice of goodies ranges from the usual (pepperoni and sausage) to the unexpected (potatoes and pulled-pork). There’s even some odd choices for your cheese and sauce foundation. How about a base of Bleu Cheese and Sriracha Mustard? Anyway, enough said about how this is not a traditional pizza joint. Trying to make mine as normal a pizza experience as I could, I asked them to just make me a plain cheese pizza. This gave mine a base of the Smoked Provolone & Smoked Mozzarella cheese and the California Plum Tomato sauce (squirted from a plastic bottle). Being non-confrontational, The Philosopher followed suit. 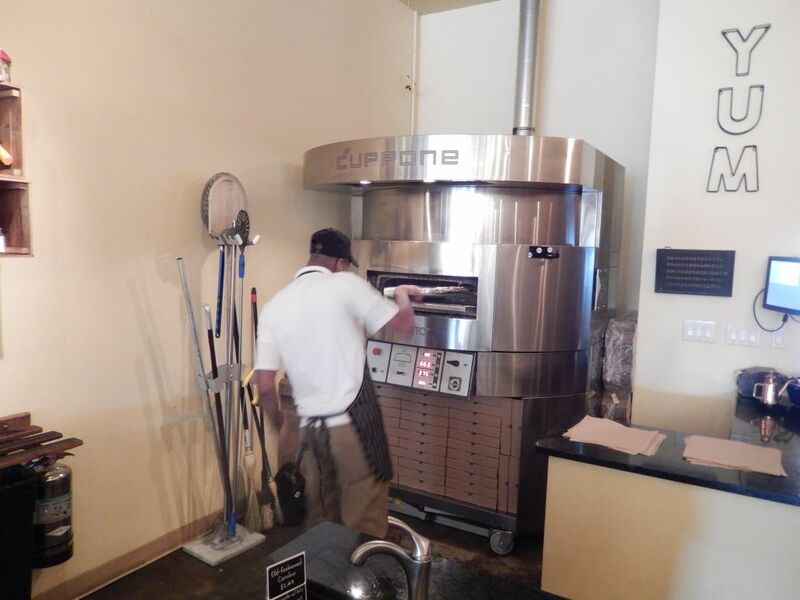 After giving the pie maker this simple assignment, he placed our rudimentary creations into a space-age oven that looked like R2-D2 from Star Wars. So how did it taste? Pretty good considering the oddity of the ingredients and how strange it looked. It also was cut into tiny little almost bite-size slices. But I must say that it really tasted delicious. The crust was charred on the bottom and was tasty and chewy although not crisp. 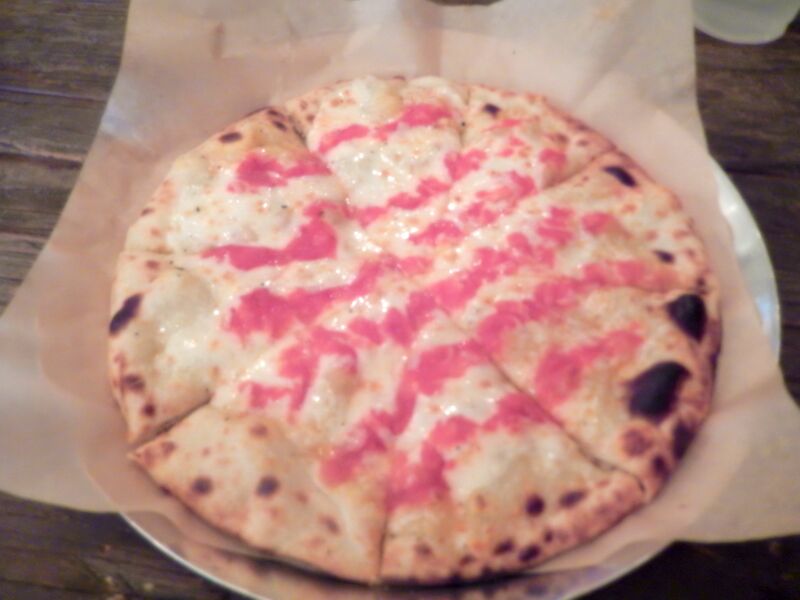 The cheese and sauce were both fresh and together they combined to make a delightful although highly non-traditional pizza. The Philosopher said it looked to him like a pretty good dorm room recipe to make a quick pizza! All joking aside, The Pizza Snob is a fine food establishment serving a great product with wonderfully fine fixings. (The kale salad that I started with was nothing less than outstanding.) But as far as this Pizza Snob goes, this one is just too far from the traditional pizza that I know and love. This place is more for a foodie than a pizza snob. I wish the Pizza Snob success in their business model which seems to be a franchise-in-waiting. But for now, I will stick with my classic New York pizza, and the only thing I want to build my own of is a burrito! Thanks for the shout out fellow pizza snob!!! Hate that you missed out on the Candied Jalapeno, pinched Italian Sausage and Alfredo pizza or the Fire-Roasted Calabrese and Smoked Provolone and Mozz with beer glazed onions. Next time you’re in town, let’s do this up right and expose you and The philosopher to a handful of Pizza Snob’s dreamy dreams. Our hope is to break every rule … excellent, home made ingredients that dazzle foodies and pizza snobs alike … job done! Love your blog!